Lindie and Justin relocate from North Carolina to the small town of Covenant, New Hampshire to start their new jobs. They purchase a "fixer-upper" and immediately get to work remodeling. One afternoon, Justin goes to get them something to drink. After too much time had passed, Lindie goes looking for Justin and finds him at the bottom of the basement stairs in a pool of blood with a pair of hedge trimmers protruding from his body. In the aftermath of the "freak accident", Lindie is badgered by a persistent detective that can't buy her explanation and can't go out in public without hearing the stinging whispers of small town New England gossip. By chance, she begins to learn of the history of her "fixer upper" and it's not a pretty story. Edward Collins, the recluse tycoon had the house built to some peculiar specifications. Those specifications helped him with his favorite past time - the torture and murder of prostitutes. Edward has been dead for over a hundred years, but it's hard to keep evil at bay forever. 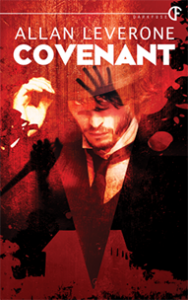 Covenant is a fun haunted house tale and my first read from Leverone. He commands the story well and you begin to feel for Lindie. At it's best, Covenant has shades of Amityville Horror in it. There are times that the dialogue feels a little forced and the introduction of a meth-head killer on the run in the middle of the story seemed awkward. It does tie together nicely at the end. 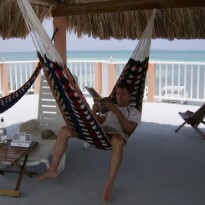 All in all, a decent read from Leverone.